Good evening my dears!! Today i have something interesting to SHARE!! Yes, it’s Mentholatum Acnes Voting Contest!!! So vote what? Vote for Mentholatum Acnes Ultimate Ulzzang!!! You know what? I realize “generation gap” is catching up on me!! I didn’t know what is Ulzzang until i saw this contest! Shucks!! Are you the same too? Fred not!! check out this blog post HERE and you will Ulzzang guru in no time!! 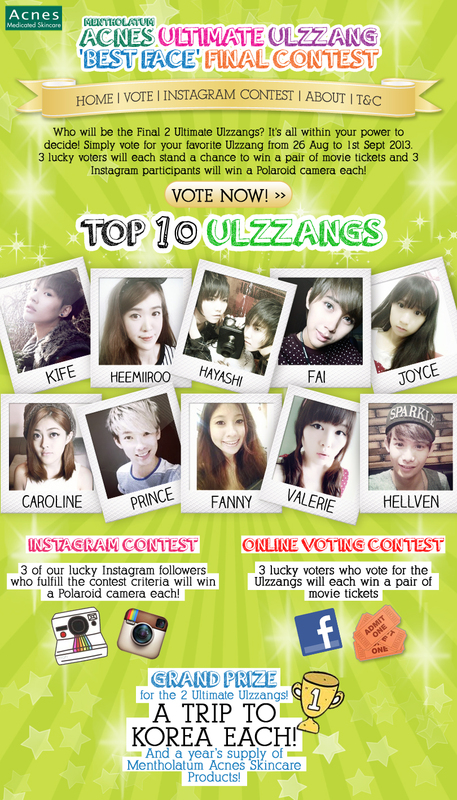 Vote for your favourite Ulzzang HERE (or click above image) between 26th Aug – 1st Sep 2013 and you will stand a chance to WIN A PAIR OF GV MOVIE TICKETS!!! Yes, you hear me! It’s a PAIR of movie tickets!! That’s not all!! There’s also a INSTAGRAM Contest!! 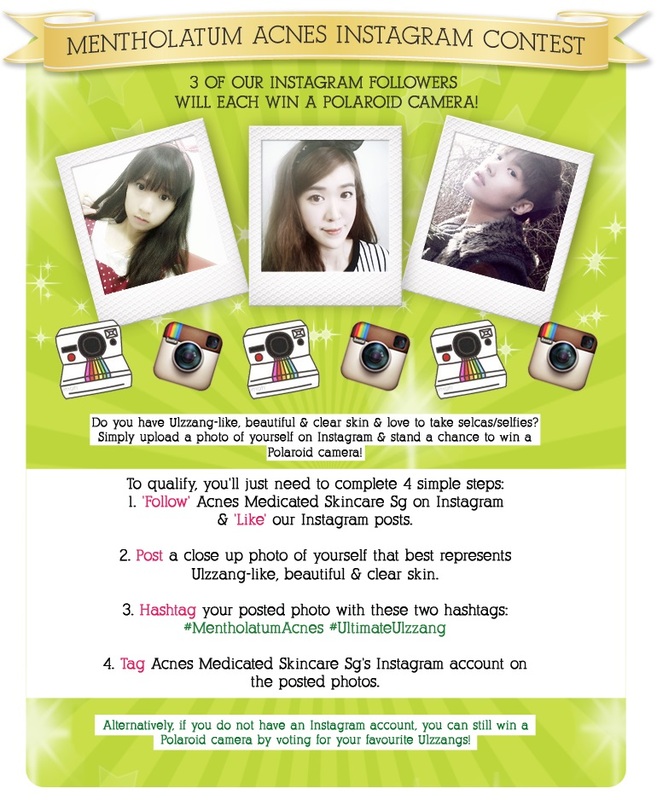 Start FOLLOWING ‘Acnes Medicated Skincare Sg’ on instagram (type “@ACNESSG” to find) and LIKE our instagram posts. Then POST a close up picture of yourself in best Ulzzang, beautiful and clear skin. Remember to HASHTAG #MetholatumAcnes #UltimateUlzzang. Last but not least, TAG ‘Acnes Medicated Skincare Sg’ Instagram account. And what’s the best part of it? 3 winners will be selected and each WINS A POLAROID CAMERA!! Want more??? No problem!!! 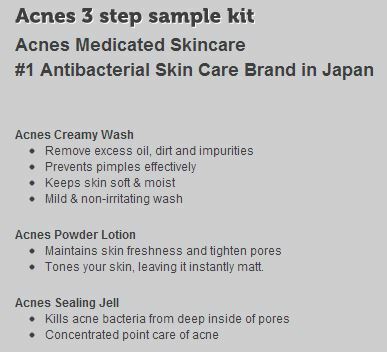 Click HERE to redeem your Acnes 3 steps kit sample NOW!!! Once, you completed the form, samples will be sent to you within 3 weeks! What are you waiting for??? Set your alarm to 26th Aug 00:00hrs and cast your PRECIOUS VOTE when the alarm RINNNNGGGGGGG~! This entry was posted in Contest/Giveaway/Samples, Mentholatum Acnes by Tempted to Love. Bookmark the permalink.